To prove that you can eat locally grown food AND stay within your grocery budget, the Dixie Classic Fair Farmers Market and the City of Winston-Salem is sponsoring the $20 Challenge twice a month from now through September in 2014. I stage a live cooking demonstration in which I prepare a meal for a family of four for $20 using ingredients I buy at the market that day. This week, I was joined once again by my temporary sous chef and friend, Chris Blackburn, chef/owner of Josephine's Bistro and Lindley Park Filling Station in Greensboro. This week was full of simplicity and decadence. Putting a knob of fresh, creamy butter in the center of a burger is not unheard of, but it's certainly not for the faint of heart. Adding even more butter to the fresh, crisp vegetables of a classic succotash is where the simplicity comes in. 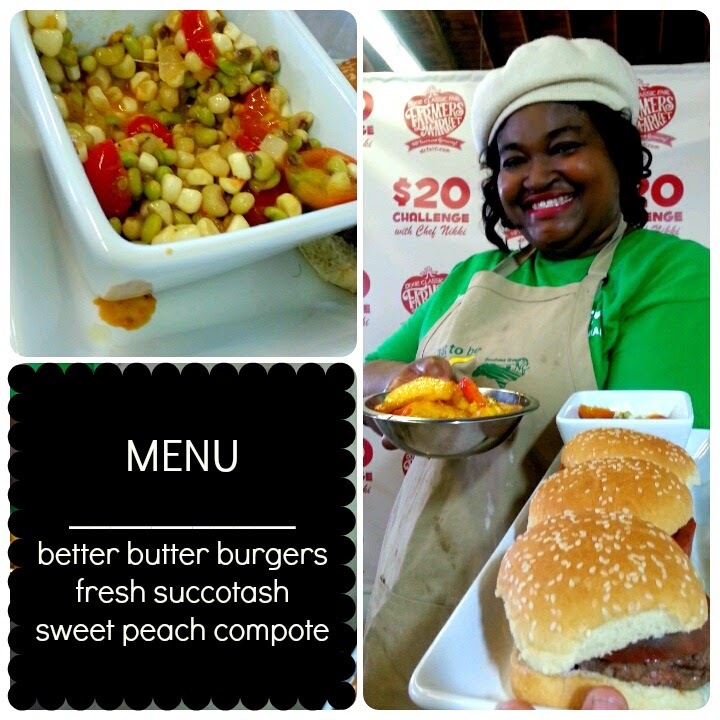 Succotash is near and dear to me and I don't take making it lightly. This version is EXTRA special because instead of the classic butterbeans, I use a variety of bean new to me: pink-eye peas. 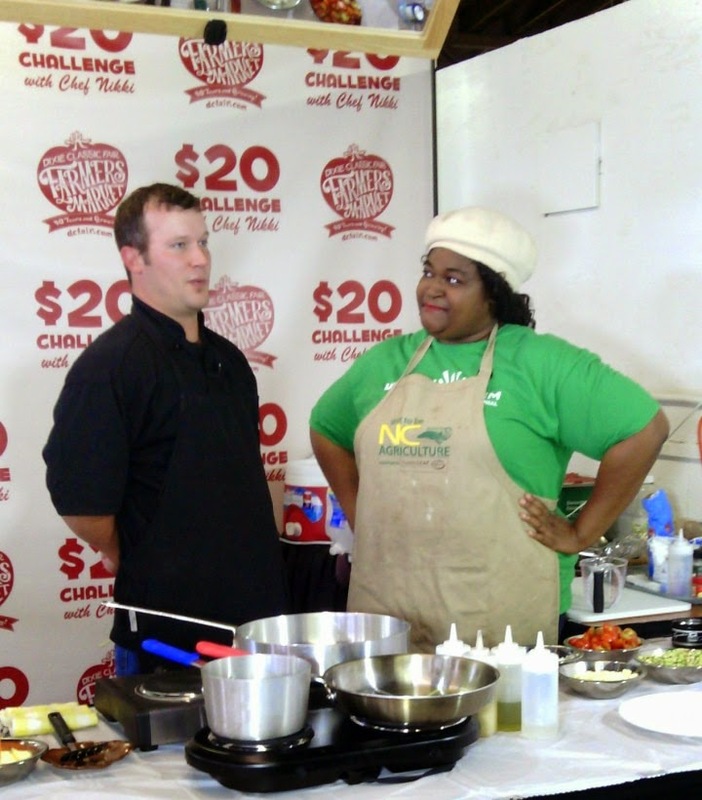 Watch the freshest episode of $20 Challenge to learn all about the fresh, local ingredients from North Carolina. Mixing whole butter into your hamburger meat or incorporating it into your meat patty is a sure-fire way to make sure your burger is juicy and full of flavor. Be sure not to handle your beef too much, as that will make it tough. You'll see in the video that I barely touch the meat as I seal the burgers before putting them in the skillet. Divide the meat into 8 loose portions, then gently flatten into thin patties. Season ground beef with Montreal steak seasoning. Place one Tablespoon of butter in the center of four of the thin burger patties, placing another burger on top. Pinch the outer edges, sealing the butter inside each patty. Melt 2 tablespoons butter in a mid-sized skillet over medium heat. Add the chopped onions and cook until butter melts, 3 to 4 minutes. Season with salt and pepper and continue cooking. Add the burger patties to the hot skillet with the onions and cook burgers for 5-7 minutes per side for medium, or until done to your liking. Allow burgers to rest for 5 minutes before serving. Spoon the now caramelized onions on top of the burgers. Meanwhile, toast the buns, season three tomato slices with salt and pepper. Assemble and serve burgers on buns with the toppings of your choice. There is not much more delicious than fresh corn and tomatoes in the summer. Both of them together automatically equal summer. As the summer goes on, the tomatoes will be sweeter and so will the corn. Hold out until you can't anymore to get the freshest ingredients for the best succotash. In a large skillet, heat oil and butter over medium-high heat. Add onion; cook until translucent, about 4 minutes. Add beans and tomatoes. Season with salt and pepper. Cook, stirring occasionally, until tomatoes are tender, about 8 minutes. Add corn. Season to taste with salt and pepper, if needed and cook for an additional 2-3 minutes. Serve. Peaches are sweet without adding sugar but why not make a little caramel to add a little extra goodness to your plate? By leaving the skins on the peaches when you cook them, the peaches will be less likely to fall apart. Place a medium-sized pot over medium-high heat. Add butter and sugars to the pot. Do not stir. Let the butter and the sugars caramelize and melt. Add peaches and coat the peaches with the caramelized sugar. Bring them to a simmer and heat them until the peaches start to break apart. Stir again to coat peaches with sugar. Sprinkle with salt. Serve. LOVE your Better Butter Burgers! I've purchased beef from the same vendor and agree that it's the best beef I've ever tasted!